Anyone who has put their minds to Arabic will know that the initial major issue is WHICH Arabic to learn, classical or dialect and if dialect, which one. Do you study the written language you can find in books, or the daily conversation Arabic which has no written form? As a parent, trying to open a little window, even a tiny porthole, onto the language and culture, this problem takes on a new form. I can read my kids books in French, normal everyday useful French. I can even read to them in Spanish, and apart from the rubbish accent it’s the same Spanish people really speak, more or less. But reading books in Arabic to your kids is rather weird. Because these simple sentences are things that no mother would ever say to her child. No-one actually speaks classical Arabic in any informal situation. And classical Arabic really is vastly different to the dialects in my unprofessional opinion. It even makes things complicated for native-speakers teaching their kids Arabic as a additional language. The result? No one reads my Arabic books to the kids. I thought people would quite like reading a story to the kids in Arabic and at the same time the kids would get some native input. So I pull out these lovely stories and they cuddle up on the sofa together, while I get on with preparing the dinner …only to hear Al Bayda Al Ajeeba (The Odd Egg) translated from Arabic into French. Or translated back into English. (Perhaps I should tape it and send it off to author Emily Gravett?) Not all my Arabic-speaking visitors do this automatic translation trick, but the majority. You’ve got to admire their linguistic flexibility. 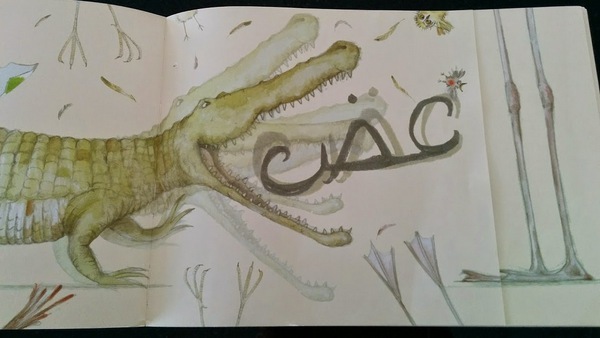 It seems that the Lebanese are so unused to reading to kids in classical Arabic (let alone speaking it to them) that they naturally slip into other languages. And we mustn’t forget all the Francophile Lebanese who speak Arabic all day long in their daily lives, but only French to their kids. No wonder many adult Lebanese find it such a drag to pick up a book in Arabic. They are not even used to children’s books in their native language (although I suppose classical Arabic doesn’t feel like their native language, and that’s the whole point). It’s a bit like French teenagers moaning about the ‘antiquated’ passé simple in French literature, but for Arabic it’s not just one verb tense which is no longer used in everyday language. It’s almost every part of speech. While it is true that we could eliminate the French passé simple and just say the same thing in everyday French, I’m a bit of a romantic when it comes to language, so although it is more ornament than instrument, it doesn’t bother me. As for classical Arabic, it can’t be superseded as there is (as yet) no accepted written form of Arabic dialects (though I love the imaginative transliterated dialect I read online). More importantly, classical Arabic crosses the borders of the many Arab countries. That’s quite a sacrifice if you decide to opt for just one spoken dialect. All the heavy debate aside, I just love to watch my 3-year old bouncing up and down on the terrace shouting “Wain el ‘amar?” (where’s the moon?) to her little brother who nearly falls over himself pointing and shouting “Amar! Amar!” (moon! moon!). Later they’ll have to learn that it is written something like “Ayna el qamar?” but for now I’m chuffed as it is. I realise it’s a bit odd trying to introduce Arabic to my kids when it’s not my language. I know that out of the three key factors - need, exposure and prestige – none are really present enough for Arabic in our family. There’s really no need to speak of, since all the Arabic speakers in the family have a second native tongue, French or English. As for exposure, the kids only get a tiny bit of exposure from my in-laws, but at least it’s authentic. However, I’m not aiming to teach them the language as such. I couldn’t if I wanted to. I just want to open their minds to it, to give them the option of tuning in to it, rather than tuning out when they hear it spoken. By viewing it as important, I can at least give it a modicum of prestige. I also thought the native Arabic speakers we know would enjoy reading to the kids, although that side of it didn’t quite work out as planned. So back to translated books. 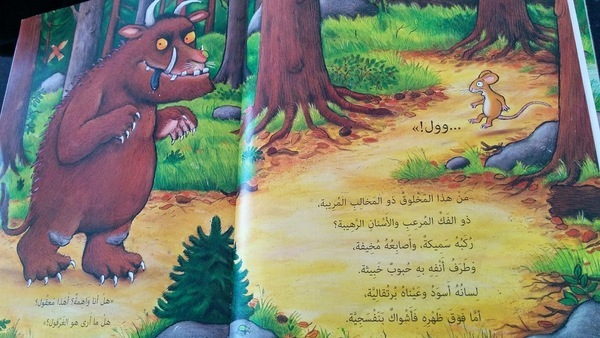 As for Al Gharfoul, as The Gruffalo is called in Arabic, I’m not qualified to judge the quality of the translation and I haven’t had much feedback from Arabic speakers. But we like reading it, and I’ve chosen a few simple expressions from it to use around the house with my three-year old, for example “ila ayna, ila ayna” (in the original, “where are you going”), “fa’ra” (mouse) and “lisayn aswad” (“black tongue”). This has been a lot of fun and my three-year old daughter does play around with these words on her own, along with a few others she has learnt. I did notice a few short vowels are not printed. Probably it’s because these are words that would rarely be mispronounced, so there’s no need to add vowels for clarification even for children. Typically, if you can read a story this long in Arabic then you know the language well enough to pronounce these words correctly. But…I don’t, really, and this story is over my head linguistically. I have to decipher it fairly slowly. If my three-year old, who understands even less, wasn’t such a bookworm and a language nerd then she’d get bored. I rarely read the entire text in one sitting, and nor does anyone else. Sometimes I do the narration in English and the voices in Arabic. 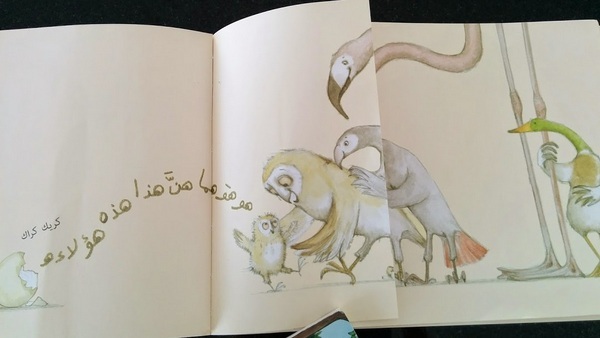 So having learnt from this, I recently ordered the Arabic translation of The Odd Egg by Emily Gravett. Ironically, I used to borrow the English original from our little library in Beirut. Back then, my daughter wasn’t two yet. There is much less text than The Gruffalo. The text is also bigger and all on a cream background, making the script easier for me to read. As for the translation, in the original, there are some words in the illustrations, for example, comments by the birds, and the title of a book which is pictured. All of this has been carefully rendered in Arabic in the same handwritten style. Much better than the Spanish translations of Charlie and Lola, aka Juan y Tolola, which are in the local library; Charlie has been renamed Juan, but in the picture his top still has Charlie written on it. I particularly like the rendering of the owl’s brainy utterance which was a list of sums in the original: in the translation, it becomes a string of literary Arabic pronouns. Conclusion: Both are lovely but I should stick to short stories for now! It might be just what’s needed to trigger some passive learning. I do want my kids to feel attached to it as a family language. I feel attached to it, and I’m only Lebanese on paper, not by blood like them. If they were to take it further later, then there are native speakers in the family, it’s just that for now we need them to help us with French! See here for Part 1 of School Enrolment in Spain. After a good look at “colegios públicos” on Google Maps, I went along to the ayuntamiento (town hall) to start my real-people-research. The ‘Department of Education’ ended up being a nameless office on the second floor. In fact, a lady from the information desk readily accompanied me to make sure I got the right place. I’m consistently surprised by how patient and helpful people are despite my terrible Spanish. In fact sometimes I wonder how they understand me at all. I stammer out stuff that I’m not even sure is Spanish, it’s probably French with a few more o’s and a few less nasals, muddled with English word order, and yet somehow they get it (probably from my body language) and answer me as if I were a normal respectable citizen. This did not happen when I moved to Paris. No-one was quite this indulgent, believe me. There are five other schools in our municipality within a 12-minute walk (thanks Google Maps for this precision!) so it’s unlikely I’ll actually end up having to drive them to school, something I really want to avoid. He *thinks* the applications are in March. I guess he too is lacking a decent web site with all the basics spelt out. In the list of establishments he jotted down for me, he marked one school with a small asterisk and another with a large asterisk. “Those are good,” he said matter-of-factly. I assume that the size of the star is linked to just how good he considered them to be. Then he told me the rest of the procedure is done through the school directly, and stood up to shake my hand. My visit was fast drawing to a close. I was still trying to figure out where to get my volante de empadronamiento to prove residence in my municipality, otherwise I would have tried to get more details on exactly what makes these two colegios better than the others. Downstairs in the town hall, I paid for a couple of tax stamps (oh, the happy memories of Lebanese bureaucracy and tax stamps) and got my volante de empadronamiento. So the next stop is to speak to some schools directly. And gather local opinions on “good” schools in the hope of unearthing some actual information. Or failing that at least practise my Spanish. Read on for part 3 and part 4. 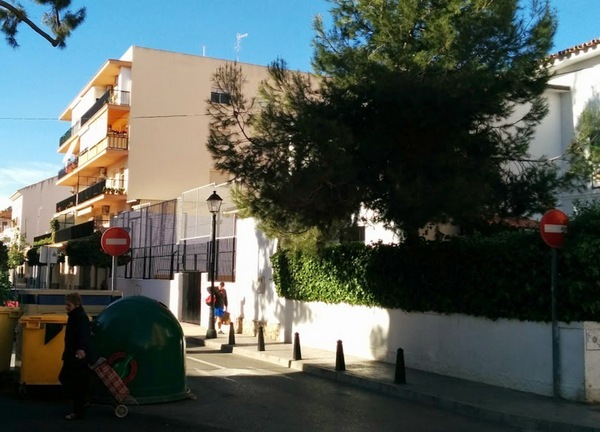 And here is some background to why we chose state school in Spain. I may have gotten out of doing the school run for an extra year, but it’s now time to get my head around enrolling my little Beiruti. The application process seems to run in February or March and there are several reasons why I should be getting a head start, not least of all the length of time it takes me to understand anything in Spanish. Also I might have to take her birth certificate to a sworn translator. In addition, she’ll be starting a year later than most kids. That’s because apparently all sane mums put their kids in school from the tender age of three (or before). That’s how they stay sane. For the crazy ones applying later, it’s supposed to be harder to find places in your school(s) of choice. I’m not too worried as there are several within walking distance. So I have been online trying to extract information from the individual websites of local state schools …which do not seem to have been designed with this purpose in mind. 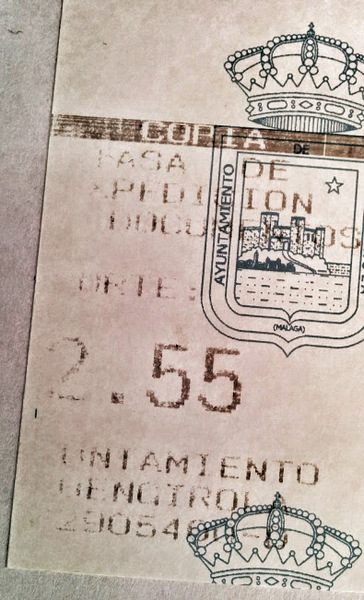 Going online in Spain is a bit like going back in time a decade. Think Mordac the Preventer of Information Services but less evil. The fact that it is all written in Spanish is the least of my problems. It’s not quite as bad as trying to find a Beirut bus map, but close. The sites that I actually managed to find for schools are labyrinths of lists of pdfs that you have to open if you want to know what’s in them. There are plenty of wonky photos of finger painting preschoolers and even video clips of songs in assembly. So many that it’s hard to get past them to find out anything at all about enrolment, school-day times, languages taught, or any of the other questions that have been filling my mind this past week. One school near my house I discover has, not a website, but a blog. Plus a blog for the parents association of that school, one for its library, one for the preschool and one for extracurricular stuff. All of them dying the slow death of blogs that were meant to be simple websites with the occasional update. Remember back when everyone thought that if you ever wanted to update your online content you needed to do it diary style??? There’s really only so many times you can blog to update the secretary’s opening hours, and to be honest I don’t want to scroll through a year’s postings to find them. Still, I managed to find the enrolment form used a few years back, when the school still remembered they had a site. I also found details on the points system, probably outdated, but it gives the spirit of the thing. I can see we won’t have much of a points capital. This could easily turn into a red-tape rant but I’m afraid I’m a non-believer. I just don’t think that everything bureaucratic is easier in the UK or wherever Home is. It may be easier for us, but it isn’t for foreigners (though the websites are more legible!). I’ve seen the other side of the coin when I looked into moving back to the UK with my US-born husband. Now that really is paperwork. Actually just getting British passports for my kids born abroad was hard because we didn’t fit in the boxes. And although you get the feeling that the goalposts shift at times (sometimes getting closer) in Mediterranean countries, goalposts in the UK sometimes feel unattainably far. I think I’ve done about as much research as I can online. I dare say I shall soon concede defeat and do it the Lebanese way, and without a doubt the Spanish way too: face to face. It’s so much easier sometimes to just have everything spelt out on some easy-to-navigate website, the Anglo-Saxon way. But you can’t buy an education online as if you’re ordering a book off Amazon, any more than you can integrate a real-life community online. And after all, there’s nothing like actually talking to the relevant people in the actual context. You get all sorts of perks you don’t get doing things the impersonal way. Anyone else going through/been through the whole procedure? Any advice on what to expect? This whole school thing is new to me but I’ve plunged into a few other blogs to get an idea of what we’re in for, including this one and this one. Next on my list is a trip to the Department of Education at the town hall, and some real-people-research to work out what is considered a “good” school in Spain and what factors we hold to be the most important in our choice.